Woman’s Own this week is packed full of festive tips, gift guides and real-life stories – twice as many as usual! Our bumper issue kicks off the Christmas period with double the gossip, fashion, beauty and food. We speak to Chloe Madeley about a traumatic Christmas experience, and find out which of her famous parents does the cooking! 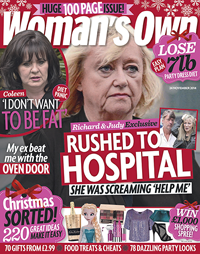 We’ve also got the details on why Coleen Nolan’s struggling with her weight loss, and the harrowing real-life tale of one woman’s escape from an abusive partner. Plus, there’s enough festive recipes for you to plan your entire Christmas meal, and our pick of the best party wear. Pick up your copy of Woman’s Own now, or get your digital copy below.